Before: Flabspace space space space After: Abs! Once again, thank you for all your support during my weight loss challenge. As I mention, it was not possible without you and your supplement line. Brett Dobesh Used "Get Lean Quick"
The terms of the bet are not important. However, what is important is that this "bet" has changed my life forever. In February, I stepped on the scale and weighed 257lbs. Although I knew I was overweight, I was comfortable in my life and made excuses for why I couldn't get to the gym more frequently. The truth was that I didn't make the gym because it was no longer a priority; I had grown weak and lazy – comfortable. March 1st, was the start of a new life for me. The road was long, and the results didn't come easy. But I had realized it was time to stop making excuses and change my outlook on life. 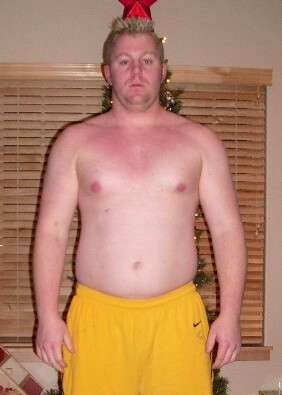 My goal, influenced by the "bet," was to have a six-pack by August 5, 2010; one week prior to my best friend's wedding. That's right: only five months to achieve something I have never had before (not even when I was biking 50+ miles a week or swimming 5000+ yards a day). I will be the first to admit it wasn't always easy. Summer was coming, and my schedule was packed with BBQs, birthdays, two bachelor parties, etc. As we all know, with those events come cocktails and awesome food. I had a choice to make: let those events take control my eating habits (cheat), or use them as motivation. I chose option two! It would be great if everyone was supportive of such goals. Unfortunately, there is a group out there who only want to bring you down. They want to see you fail – I call them "haters". I chose to surround myself with people who wanted to see me achieve a personal goal, though. Everyone else could have my attention after August 5th. The most important lesson I learned from this was to surround myself with people who supported my goals and, more importantly, believed in me. I couldn't have been successful if it hadn't been for my "Four Pillars" - I took bits and pieces from each of them and used that to achieve my goal. Pillar one included my wife Elizabeth, daughter Kya, and son Kobe. My goal effected our day-to-day lifestyle. Making time to get to the gym and making the right eating choices effected more than just me. In this time, we grew as a family and in the process continued to teach our children the importance of a healthy diet and exercise. - Thank you. The second pillar included my mentor Gabe and his wife Emily. Much as I wanted to hear how great I was doing, Gabe was my reality check on countless occasions. He helped me break my goal out into smaller, more attainable goals. It was important for me to learn the importance of small victories along the way. Gabe challenged me everyday. Sometimes tough love is what makes you grow the most. – Thank you. My next pillar was Grant Turner, a 4-year varsity collegiate wrestler. I thought I was getting in solid workouts until I worked with Grant. He had all sorts of "fun" ideas to incorporate into my daily routine to make sure I was getting results. I have never done so much cardio. – Thank you. My final pillar was Paul Becker from trulyhuge.com. Paul took me under his wing, and introduced me to one of his product lines called "Get Lean Quick". In the final weeks, this program was a game-changer. He was an amazing resource! Supplying your body with the right nutrition is essential, especially in the final hour. Having a guideline and resource to plan the final two weeks leading up to August 5th was the best decision I could have made. My results were not possible without Paul. I would encourage everyone who is wanting to make a life change and truly embrace health and fitness to try Paul's supplement line as a resource. – Thank you. The proof is in the pudding. 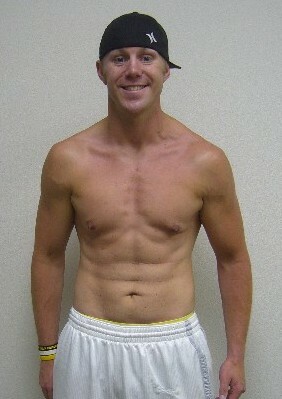 August 4th, one day prior to my goal, I had a 6-pack. I lost 67lbs in five months. The keys to my success were surrounding myself with the right people, reaching out for help from my "4 Pillars," staying focused with diet and gym,and embracing a lifestyle of health and fitness. My life is changed forever, and I feel amazing. To be successful you don't need a "bet," you just need to believe in yourself. Once again, thank you to everyone who believed in me.